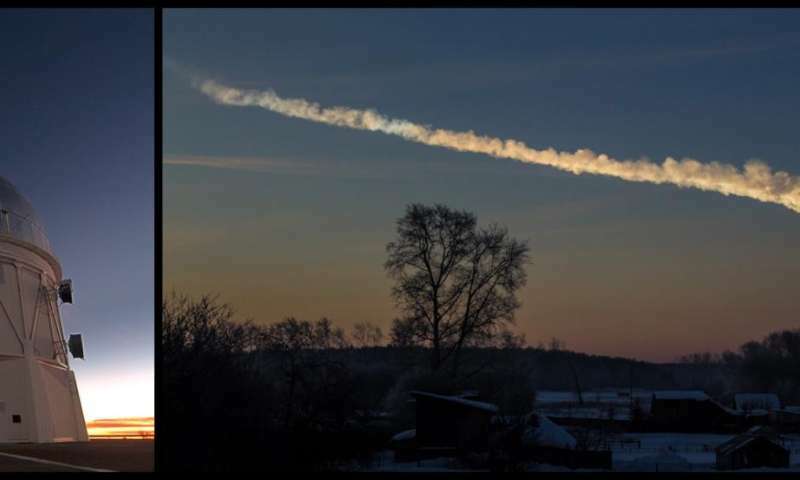 In 2013 a small meteoroid, the size of a house, hurtled through Earth's atmosphere and exploded over the Russian city of Chelyabinsk. The explosion shattered windows, and more than a thousand people were treated for injuries from flying debris. How many similar-sized rocks have orbits that bring them close to Earth? A new study has answered that question using the Dark Energy Camera (DECam) on the Blanco telescope at the Cerro Tololo Inter-American Observatory. The result lends new insights into the nature and origin of small meteoroids. Near Earth Objects (NEOs) are asteroids or comets whose orbits bring them close to Earth's orbit. Their close approach makes them a potential Earth-impact hazard capable of causing widespread destruction. While very large (10 kilometer-sized) impactors can induce mass extinction events like the event that led to the demise of the dinosaurs, much smaller impactors can also wreak havoc. The meteoroid that exploded in Chelyabinsk unleashed a powerful shock wave that destroyed buildings and blew people off their feet. Relatively petite at a 'mere' 17 meters in diameter, comparable to the size of a 6-story building, the impactor, when it exploded, released about ten times the energy of the Hiroshima atomic bomb. A survey for NEOs being carried out with DECam on the 4-m Blanco telescope at the Cerro Tololo Inter-American Observatory has now estimated the number of objects in near-Earth orbit that are similar in size to the Chelyabinsk impactor. Lori Allen, Director of the Kitt Peak National Observatory and the lead investigator on the study, explained, "There are around 3.5 million NEOs larger than 10 meters, a population ten times smaller than inferred in previous studies. About 90% of these NEOs are in the Chelyabinsk size range of 10-20 meters." The study, to be published in the Astronomical Journal, is the first to derive, from a single observational data set with no external model assumptions, the size distribution of NEOs from 1 kilometer down to 10 meters. A similar result was obtained in an independent study that analyzed multiple data sets (Tricarico 2017). While the surprising results do not alter the impact threat from house-sized NEOs, which is constrained by the observed rate of Chelyabinsk-like bolide events, they do lend new insights into the nature and origin of small NEOs. David Trilling (Northern Arizona University), the first author of the study, explained how the study reconciled the surprisingly small number of house-sized NEOs with the observed rate of Chelyabinsk-like events: "If house-sized NEOs are responsible for Chelyabinsk-like events, our results seem to say that the average impact probability of a house-sized NEO is actually ten times greater than the average impact probability of a large NEO. That sounds strange, but it may be telling us something interesting about the dynamical history of NEOs." Trilling speculates that the orbital distributions of large and small NEOs differ, with small NEOs concentrated in bands of collisional debris that are more likely to impact Earth. Bands of debris could be produced when larger NEOs fragment into swarms of smaller boulders. Testing this hypothesis is an interesting problem for the future. Estimating the study's detection efficiency was critical to the result. Frank Valdes (NOAO), who developed the data reduction and analysis pipeline for the project, pointed out that "The best way to measure detection efficiency is by implanting synthetic NEOs into the data stream and then detecting the fake ones in the same way real NEOs are detected." Well-matched to the study of small, faint NEOs, the large aperture of the 4-meter Blanco telescope and the wide field-of-view of DECam were also vital to the study. Describing the broad science reach of DECam, Allen remarked, "DECam has the power to revolutionize many fields of astronomy, from our understanding of dark matter and dark energy, to the search for distant planets in our Solar System and our understanding of the near-Earth environment." Very nice article! It illustrates the fact that assumptions like "there is no correlation between X and Y" (i.e., between size and impact risk) must always be justified and tested. One thing: You refer to the Chelyabinsk impactor as a "meteoroid". That is technically incorrect. Meteoroids are defined to be objects smaller than about 1 meter. The Chelyabinsk impactor (and all the objects discussed in the paper) are small asteroids, not meteoroids.